The approaching solar cycle 24 minimum continues the long slide in solar activity | Watts Up With That? Solar cycle 24 is ending and we are approaching a time of minimal solar activity between solar cycles 24 and 25, known as a solar minimum. Despite claims that we understand how the Sun works, our solar predictive skills are still wanting, and the Sun continues to be full of surprises. Solar scientists did not pay much attention to the early warning signs that the Sun was behaving differently during solar cycle 23 (SC23), and to most the surprise came when the expected solar minimum failed to show up in 2006. The SC23-24 minimum took place two years later (Dec 2008, according to SIDC), and despite showing only a tiny difference in total solar irradiation compared to previous minima of the space age, it displayed significantly reduced solar wind speed and density, extreme-UV flux was 10% reduced, the polar fields were 50% smaller, and the interplanetary magnetic field strength was 30% below past minima. In response to the changes in the Sun, the density of the Earth thermosphere dropped 20% lower than in previous minima. In 2007 Svalgaard & Cliver proposed a floor to the interplanetary magnetic field at 1 AU in the ecliptic plane of 4.6 nT based upon 130 years of data. This floor has implications for the solar wind during grand minima. After the solar minimum, in 2011, Cliver & Ling were forced to revise down the floor to 2.8 nT, a 40 percent reduction! The SC23-24 minimum was truly shocking to solar scientists, showing them how little they knew of what happens to the Sun when it becomes very inactive. And it was just a centennial-type solar minimum, not a grand-type solar minimum. The rapid decline in solar activity plus the appearance of the first SC25 spots suggest that SC24 could be both a low-activity and short solar cycle. This would not be unusual since cycle length and cycle activity do not correlate significantly (figure 1). Figure 1. Solar cycle activity versus cycle length. The activity is the sum of the monthly sunspots for the entire cycle. SC24 (in red) is still provisional, and the dashed arrow indicates a possible path it might follow until the solar minimum takes place. The Dalton Minimum (purple), Gleissberg Minimum (blue), and Modern Maximum (orange) cycles are indicated. The Modern Maximum is a period of seven consecutive high activity solar cycles in a period that coincides with high anthropogenic CO2 emissions and global warming (1935-2005). The longest such stretch of high solar activity known. We have read at WUWT both that the solar minimum may have already happened, or that it might take place in 2026. None of these opinions appear to be based on much fact, so we should examine the question in more detail. Some of them are shown in table 1 from Harvey & White 1999. Table 1. Illustration of the problems of defining the solar minimum. Column 2 shows the date given by prominent researchers. Columns 3-7 give the date of the minimum activity as calculated by different methods. Source: Harvey & White 1999. Rs= (0.5 Rm±6 + Rm±5 + Rm±4 + Rm±3 + Rm±2 + Rm±1 + Rm) / 12 ……. Where Rs is the smoothed sunspot number and Rm the monthly sunspot number for the central month. The end months in the average are given half weight. This formula produces Aug. 1996 for the SC22-23 minimum so, despite being very simple, the result is generally quite close to more complex calculations. Rs= (Rm±4 + 3 Rm±3 + 5 Rm±2 + 7 Rm±1 + 10 Rm) / 42 ……. Figure 2 shows the result of smoothing  compared to SIDC smoothing . Figure 2. Sunspot smoothing used in this article  (grey line) compared to the SIDC smoothing  (black line). Have we reached already the SC24-25 minimum? The answer is almost certainly not. We can base this answer on two kinds of data. The first is the number of spotless days. Astronomers have been counting the number of spotless days since 1818, and this number in the current minimum, as of first of June is 198 (Figure 3). 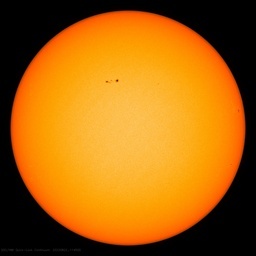 As the solar minimum usually takes place after at least half of the spotless days in a minimum have taken place (the rising phase of the cycle is usually faster than the declining phase), that would imply that this minimum should have less than 400 spotless days if it ended now. Such a low number has only taken place in minima between very active solar cycles during the Modern Maximum in solar activity (1935-2005). Given that SC24 has been a low-activity cycle we should expect 200-300 spotless days more before the minimum is reached, and that is about a year of very low solar activity. Figure 3. Number of spotless days per cycle minimum transition (red) and the yearly international sunspot number (Sn, inverted, green) since 1818. Note that, in general, a low amplitude cycle is preceded by a solar cycle transition with a high number of spotless days, and vice versa. The blue dot to the lower right represents the number of spotless days (198) for the current cycle transition. Source: WDC-SILSO. The second kind of data are the number of SC25 sunspot groups. SC25 sunspots have been appearing since December 2016, but the solar minimum is usually located at the time when the numbers of SC24 and SC25 sunspot groups are even, or slightly later. As it can be seen in figure 4, we aren’t there yet. Figure 4. Monthly number of sunspot groups (having received a NOAA number) from SC24 (black) and from SC25 (white) since 2016. The red curve represents the smoothed monthly international sunspot number. Source: Solar-Terrestrial Centre of Excellence. When is it most likely that the SC24-25 minimum will occur? Most of the analyses I have seen have one problem. They only look at a subset of solar cycles, and the space-age records are biased by the high activity of the Modern Maximum. I have been inspired particularly by Belgian astronomer Jan Janssens’ SC24 tracking webpage. Using the smoothing filter , and following Janssens, I have defined the starting point of the analysis of each minimum as the last month that showed ≥ 30 monthly smoothed sunspots before the minimum. In figure 5 I have represented the number of months it took for each transition from that starting point to reach its solar minimum (lowest smoothed monthly sunspot number or central month when several consecutive zero values). Figure 5. Distribution of solar cycles by the time it takes them to go from ≥ 30 monthly smoothed sunspots to their solar minimum. The distribution shows a clear difference between cycles with less than 14 months and cycles with more than 19 months. The distribution is clearly bimodal. 13 transitions took between 8 and 14 months to reach the solar minimum from ≥ 30 smoothed sunspots (short or fast solar minima), while 11 transitions took between 19 and 44 months (long solar minima). For the SC24-25 transition the value of 30 smoothed monthly sunspots was reached in October 2016, 20 months ago as of this writing. For graphical convenience I have divided the long solar minima in two groups. The medium solar minima (19-32 months), and the slow solar minima (38-44 months). Figure 6. Comparison of the present solar minimum (in red) to the group with fast (short) solar minima. The present solar minimum does not belong to the group characterized by short solar minima. The sunspot number is falling too abruptly, and the solar minimum should have been hit by December 2017 to belong to the group. As of June (corresponding to January 2018 smoothed data) the smoothed sunspot number is still decreasing and given the evolution it will decrease again next month. Figure 7. Comparison of the present solar minimum (in red) to the group with medium speed solar minima. The present solar minimum could belong to the medium group. This group includes solar cycle minima from the Dalton and Gleissberg extended minima, but also the unusual 1986 SC21-22 minimum. If SC24-25 belongs to this group the minimum should take place between May 2018 and September 2019. For that to happen the decrease in sunspots should slow down soon, since the chance that its smoothed value hits zero or near-zero is quite low, as only one of the seven (SC6-7) in this group did so. Figure 8. Comparison of the present solar minimum (in red) to the group with slow solar minima. The present solar minimum could also belong to the slow group. As we can see fast declines in sunspots are common in the early phase of this group, but they are usually followed by a recovery of activity that can last up to a year before the decline resumes. The last SC23-24 minimum belonged to this group and they usually reach very low values or even zero as in the case of the extreme 1810 SC5-6 Dalton solar minimum. If SC24-25 belongs to this group, the minimum should take place between late 2019 and mid-2020. For that to happen the decrease in sunspots should actually revert soon and increase for several months before declining again. Considering all solar minima since 1750, we can say that it is most likely that the SC24-25 minimum will take place between the summer of 2018 and the summer of 2020. The reason why a slower decay of sunspots had been predicted for SC24 is that the rising and decaying phases of past solar cycles were generally slower for low-activity cycles than for high-activity cycles, so the minima of low-activity cycles tend to last longer than average. We can see this in figure 9. Figure 9. Solar minima since 1750 and the sunspot record. Solar minima are represented as black boxes with their length corresponding to their time below 30 sunspots (grey horizontal line), and classified as fast, medium, or slow according to their time to the minimum as in figure 5. Arrows mark the positions of the cyclical lows of the centennial and bicentennial solar cycles. More than half of the minima between a high-activity and a low-activity cycle are long, and every minimum between two low-activity cycles is long. Since SC24 is a low-activity cycle, and SC25 is expected to be also a low-activity cycle, the SC24-25 minimum is expected to be a long one. Additionally, we observe that most of the long minima, and particularly the longest ones, take place at the lows of the centennial and de Vries (210-yr) cycles of solar activity (arrows in figure 9). As we are currently at a centennial low in solar activity it is more likely than not that the SC24-25 minimum is a long one. Thus, SC24 should not be a particularly short cycle. We can also get an idea of when the SC24-25 minimum might take place by looking at the speed that some solar features are “migrating” towards the equator. Sunspots are not useful for this, but looking at regions of local maxima in the spectral corona at the Fe XIV 530.3 nm line we can still see them appearing closer to the equator (figure 10; Aliev et al., 2017). Figure 10. Latitudinal-temporal diagram of the position of local corona maxima at the solar spectral corona in the green Fe XIV 530.3 nm line. Source: Aliev et al., 2017. Arrows mark the position of solar maxima, and vertical black lines of solar minima. Red lines indicate the axis of the displacement over time towards the equator of the position of corona maxima. Blue lines indicate the same for the displacement towards the poles. Lines added by me. Analysis of the rate of displacement (figure 10, red lines) of active coronal regions, as observed at the green 530.3 nm coronal line, suggests that the SC24-25 minimum could be reached by February 2019. For more on the green spectral line in the solar corona see here. A similar analysis has been done more in depth by Petrovay et al., 2018 using another feature of the green coronal line, the rush-to-the-poles (RTTP) coronal polar regions. These are active coronal regions that appear at ~ 55-60° at the time of the solar minimum but move progressively closer to the poles, reaching them near the time of the solar maximum (blue lines in figure 10). This “migration” is postulated to be a manifestation of the buildup of the poloidal field. Petrovay et al., 2018 find a correlation between the rise rate of the RTTP and the time delay from the ending of the RTTP to the maximum of the following cycle. A rapid rise of the RTTP rate indicates the maximum of the next cycle will take place earlier. From that correlation they expect the maximum of SC25 to occur at October 2024. From that prediction they use two other known correlations, the Waldmeier effect, or anti-correlation between time from cycle minimum to maximum and cycle amplitude (figure 11A), and the correlation found between the amplitude 2.5 years before the minimum and the amplitude at maximum (figure 11B). Using these two correlations Petrovay et al., 2018 deduce that SC24-25 minimum will take place at April 2019 and SC25 will have an amplitude of 130 smoothed sunspots, same as SC16 and slightly above SC24 (116 sunspots). The date they give is in general agreement with the rest of the information presented here. Figure 11. Solar cycle correlations. A) Correlation between cycle rise time from minimum to maximum (trise, in years) vs maximum cycle amplitude (Rmax, in smoothed sunspots), known as the Waldmeier effect. B) Correlation between maximum cycle amplitude Rmax and sunspot number value 2.5 years before the previous minimum R(tmin − 2.5). Red dashed: fit to all data points; blue solid: cycle 19 treated as outlier. Source: Petrovay et al., 2018. The Australian Bureau of Meteorology Space Weather Services runs a solar activity page on monthly sunspot numbers and 10.7 cm solar radio flux. They predict a solar minimum slightly lower than the SC23-24 minimum for July 2019. No information is provided about the model they use. SILSO also runs several prediction methods. The Standard Curves method (SC, based on Waldmeier) and the Combined Method (CM, based on Denkmayr & Cugnon) are part of the 13-year sunspot number and forecast graph displayed at SILSO home page (figure 12A). Over the past year the CM method performed quite badly, predicting more than double the activity that has been observed (figure 12A, black curves), while the SC method has performed better. For the next year the SC method predicts a fall to zero sunspots average for at least 11 months starting this month (figure 12B). I consider that prediction to be very unlikely. The CM method predicts a solar minimum for February 2019 (figure 12C), which is in general agreement to the evidence presented. A third method not shown, the McNish & Lincoln method, is also available at the forecasts page of SILSO, and predicts the solar minimum for December 2018. Figure 12. WDC-SILSO sunspot record and forecasts. A) 13-year record of daily (yellow), monthly (blue), and monthly smoothed (red) sunspots. 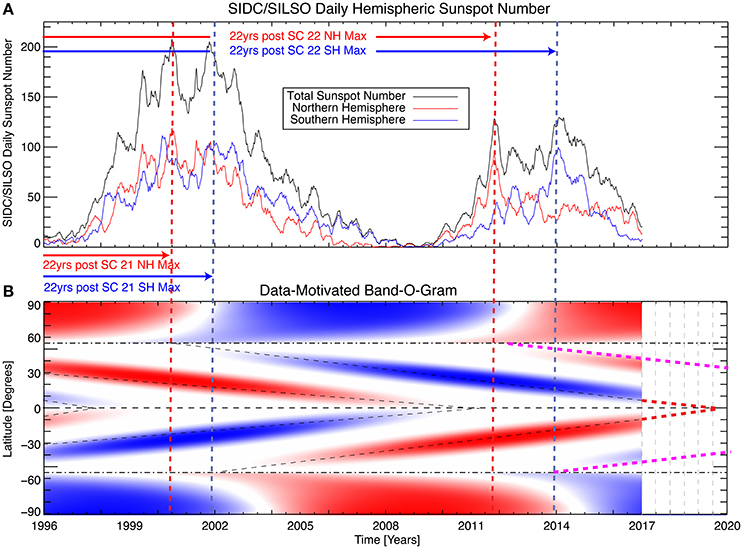 Dotted line shows the 12-month sunspot prediction by the Standard Curves Method, and Dashed line by the Combined Method. In red the current prediction, and in black the prediction from May 2017. B) 12-month sunspot prediction by the Standard Curves Method. C) 12-month sunspot prediction by the Combined Method. Source: WDC-SILSO. Table 2. Predicted dates for the coming solar minimum presented in the article. The predictions are centered on March 2019. As usual, extreme opinions that this could be a monster minimum (David Archibald, 2017), or that it will take place so soon (or already) that will make SC24 one of the shortest cycles, are unlikely to be correct. If the minimum takes place indeed by early 2019, we can expect the next minimum by 2029-30, indicating that the current period of below average solar activity should extend until ~ 2032. Afterwards I expect that solar activity should return to levels typical of the 20th century Modern Maximum. Aliev, A. K., Guseva, S. A., & Tlatov, A. G. (2017). Results of Spectral Corona Observations in Solar Activity Cycles 17–24. Geomagnetism and Aeronomy, 57(7), 798-802. Cliver, E. W., & Ling, A. G. (2011). The floor in the solar wind magnetic field revisited. Solar Physics, 274(1-2), 285-301. Harvey, K. L., & White, O. R. (1999). What is solar cycle minimum?. Journal of Geophysical Research: Space Physics, 104(A9), 19759-19764. Petrovay, K., Nagy, M., Gerják, T., & Juhász, L. (2018). Precursors of an upcoming solar cycle at high latitudes from coronal green line data. Journal of Atmospheric and Solar-Terrestrial Physics. Svalgaard, L., & Cliver, E. W. (2007). A floor in the solar wind magnetic field. The Astrophysical Journal Letters, 661(2), L203. I think you mean July 2019 not 2009 in the text for BoM. Yes. That typo escaped proofreading. Thank you. As before you are confused. If we want to investigating the effect of the sun on the Earth [or anything], we should, indeed, use what you call the ‘minimum’, but when it comes to investigate what the Sun is doing [e.g. for predicting solar activity], we must recognize that each individual ‘cycle’ is really 16-17 years long and overlap with neighboring cycles for several years, so that the very concept of a solar minimum becomes rather meaningless. The concept of solar minimum is important for everything that matters, as all solar emissions, irradiation, particles, interplanetary magnetic field, solar wind, display a minimum. It is also important from the point of view of satellite drag that reaches its lowest value, and space travel safety that is also at its lowest due to a maximum in GCR. Cosmic radiation is also important for airline workers as their level of irradiation also reaches a maximum. No. I am not confused. Where the confusion comes in is when trying to use the concept of solar minimum to predict where the next cycle is going. This you cannot do, as ‘cycles’ overlap, making the solar minimum quite artificial and not useful for prediction. So, you are, indeed, VERY confused. I haven’t used the solar minimum to predict where SC25 is going. Did you read the article? It is about predicting when the solar minimum will take place. So no, you appear to be the confused one. With respect, since the timing of minimum is a function of BOTH the current dying cycle and the rate and timing of the pickup of the next one: you are trying to predict some parameters of the next cycle. The idea that a long min to min interval indicates a weak coming cycle and a short period indicates a strong coming cycle are based on the strength of leading tail over powering the fading cycle. you cannot estimate the timing of minimum without , in some way anticipating the character of the coming cycle. I am not sure that is correct. Only half of the minima between a high activity cycle and a low activity cycle are long. And it is not determined by which one occurs first. So I don’t think you can predict from the solar minimum how the next cycle is going to be. Except perhaps that if the present cycle is low activity and the minimum is short, the following cycle should be high activity. Whilst I am one whose gut tells me that the sun probably plays an important role in climate change, I have yet to see any quality data backing that up. We are very lucky to have the benefit of Leif’s knowledge and insight. He often puts a dampener on things, but that is usually nothing more than pointing out the inadequacies and shortcomings of the data that people are using. And that is the problem in Climate Science. Almost all the data is not fit for scientific study, and that is why we are here arguing about what the science says or does not say. The back and forth, now and in earlier posts, between Leif and Javier sounds more personal than science based (at least to me). 16-17 year sunspot cycles make no physical sense. It is most likely that cycles are 21-22 years long. For the initial couple of years sunspots propagate from convection zone into photosphere and in the last couple of years the neutralisation of the magnetic field propagates in the opposite direction, making sunspots invisible in both cases, but that doesn’t mean that they do not exist. This means that all ‘odd’ (1,3,5 ..) cycles are internally connected and so are the ‘even’ cycles. Under such circumstances it is misleading to talk of the ‘odd’ and ‘even’ cycle, but a more meaningful scientific terminology would be ‘positive’ and ‘negative’ 21-22 year long cycles. Since sunspots are associated with the rise and fall of the solar toroidal magnetic field (sunspots normally appear in pairs) thus direction of the ‘intra’ magnetic field would define polarity of the cycles. In the northern hemisphere direction of the magnetic field vector B coincides with the direction of solar rotation (positive orientation, B>0) during ‘even’-numbered cycles, it is the opposite for the southern hemisphere. Relationship between direction of rotation and the magnetic field vector orientation is reversed during ‘odd’-numbered cycles (for the northern hemisphere B<0). Taking the northern hemisphere as the polarity reference, the ‘even’ cycles are the ‘positive’ cycles while the ‘odd’ cycles are the negative ones. Furthermore, number of authors posit a twin solar dynamos, one in each hemisphere, running in magnetic nearly counter-phase. Your sense of physics fails you. The way the solar ‘cycle’ works is that at ALL times, magnetic flux is erupting from the deep to the surface at lower latitudes and at ALL times, magnetic flux is advected [‘sinking] into the deep from the surface, where is completes the circulation. The erupting flux forms sunspots, and there are for several years TWO sunspot ‘zones’ in each hemisphere [at different latitudes]. Because the transport towards the polar regions is very much a random process [only a tiny fraction of the erupted flux makes it], each cycle [lasting 16-17 years] effectively erases the memory of the previous cycle, so there is no ’22-yr cycle’. It is, indeed, nonsense to talk about even and odd cycles as being distinct and connected. Each cycle is a unit in itself. No sir, there is no such thing as 16-17 year cycle. Solar magnetic cycles, sunspots are magnetic features of the solar activity which is ~22 years long. No single source can generate ‘overlapping’ cycles, and since there are good reasons to assume that there are twin solar dynamos, in this case acting in anti-phase, i.e. the positive cycles break out while the negative ones are dying down (in the either hemisphere) and vice versa, as the Sunspot Butterfly Diagram clearly demonstrates (see below). The fact that the telescopes observers see on the surface (photosphere) only 16 – 17 years of (e.g. positive, B>0) magnetic activity, but peaks of this type of activity are separated by ~22 years it makes it 22 year long positive cycle (B>0). This is also the case when the B<0, i.e. peaks are separated by ~22 years, which again makes it 22 year long negative cycle. The above is reinforced by the data from the sun’s 22 year long polar fields periodicity (lagging/leading by 90 degrees). Thus, what solar telescopes observers record is the overlapping of ~22 year long cycles, of which only about 16-17 years long period may be visible and optically recorded. If more advanced technology is used to observe magnetic events below the surface then a confirmation of the complete 22 year periodicity would follow. Leif, it is patently futile to try to instill a sense of generative physics into the conversation — when people insist on defending the conventionality of the mainstream belief system so doggedly. The truth is both: There is an “observational cycle” for sunspot activity as everyone knows, of choose-your-measure: about 11 years for the signless half-cycle or about 22 years for the Full Monte. … and … on the interior of the larger macrocycle pattern there are your 15–17 year polarization phases which definitely overlap as the butterfly diagrams so aptly demonstrate. I have +1’d your comments in keeping with this. Fact that there is a period of 16-17 years long in which the hemispheric sunspot effects of same magnetic polarity are visible, it doesn’t make it cycle, it is just a part of a longer in this case 22 year cycle, since it cannot be part or harmonic of a shorter 11 year cycle. For an event to be a cycle it needs to repeat itself with same or nearly same periodicity, as measured between its maxima, or minima or zero-crossings, or another characteristic pointer in time. Since there are no records of anything known repeating (oscillating) at 16-17 years periodicity within solar activity there are no 16-17 year long cycles. p.s. most of my engineering carrier was dealing with all sorts of cycles and associated matters, detection, measurements, filtering, suppression, interference, cross-modulation etc.etc..
22 years is the time for reaching the equivalent position in the diagram. Leif is not very fond of cycles so it is not surprising that he has troubles defining one. It is actually ironic that he will invent a 17-year cycle that doesn’t exist. is banned from the website! indicator for making accurate predictions. and think he is an expert ! Sorry to disappoint but that is not the case. This article is not controversial. It is part of forecasting solar activity, that is a hugely important issue. Just after the minimum solar activity will start increasing. That’s why there are scientific articles on the issue and many models of solar activity prediction. Besides some planetary hypotheses predict a solar minimum for a certain date, if the minimum does not take place close to that date some hypotheses will be falsified. When the forecasting methods are known, the question is if they are good methods or bad methods, and if they are bad methods they will be discarded when they fail. That’s how science works, not by chance. but deliberately, or inadvertently, have not answered my questions. a few good predictions, was more than a lucky guesser? how would his knowledge make the world a better place? It would make the world less ignorant. Whether scientific advance makes it better or worse is a matter of opinion. I already answered. Because of the method employed. If a method leads to improved predictions then it is a good method. Guessing has nothing to do with it. It has to be based on a method that other scientists understand and can use with the same improved result. This should be an interesting thread on comments. Interesting post, Javier, but not allowing for overlap? No surprise whatsoever to the NASA TRCS GROUP!!! What is clear is no one knows what the sun is going to do moving forward. I do not care how long or short this solar cycle may be. I think post 2005 sub solar activity has been established in contrast to very active solar activity prior to that time and I think the sub solar activity in general which started in year 2005 is going to continue moving forward. Of course we know what our sun is going to do. We had the double flip of the poles in 2014 which is the bottom of the gb sine wave. There is no extended minimum predicted so everything is set for SC 25 which will be a similar repeat of SC17 onward. A really nice summary of predictive methods, Javier! (At least, for this ‘solar neophyte’!) Thanks! Now, will ol’ sol behave as predicted… or surprise us yet again? Time will tell, as we are all just observers in this grand fusion-powered experiment! Just imagine if we had GCM’s trying to predict the global average temperature based on sun activity. Some of the simulations would have all the CO2 burned up by the sun . All GCMs ever have included solar activity. As the minimum is not a deterministic outcome it is not possible to predict it with certainty. But we keep learning and so we can assign probabilities that will be better as our knowledge advances. As I have shown there is a high probability that the minimum takes place between Dec 2018 and July 2019, and a very high probability that it takes place between the summer of 2018 and the summer of 2020. I have written this article because there were articles at WUWT saying that the minimum had already taken place, or that it was going to be very late, or deeper and longer that the SC23-24 minimum. I hope that after reading this article people here will have a better idea of a solar minimum and when this one is likely to occur. As you can see in the comments several people expect the minimum in 2020 or later, so different hypotheses and predictions will be tested. As an example, given that the SC23-24 minimum was taking place in a centennial low, and that there was a significant possibility that SC24 was a low activity cycle, the probability that SC23-24 was a long minimum was high before it took place. With our present knowledge that should not have been a surprise. What strikes me is that the shape of the transition from maximum to minimum seems to be a reasonable predictor of the strength of the next cycle. Short, steep, mostly linear transitions indicate a stronger cycle is on the way. Longer, but mostly linear transitions indicate not much change ahead. More non linear transitions, which also generally take longer, seem to indicate a weaker cycle is on the way. Have you tried to draw a line from when the final transition starts to when it stops and see how the slope and/or the area between this reference line and the actual transition correlates to the strength of the next cycle? Solar physicists have looked at every possible correlation between any two parameters from solar cycle. The clearest one is that the rise from the minimum correlates with the amplitude. It is another way of defining the Waldmeier effect. As you indicate, there appears to be also a correlation between the decline rate and the next cycle activity, but it is not as strong. The empirical planetary ordering of solar cycles indicates the coming minimum not before 2020-2021, a double maximum through 2025-2027 for SC25, the following minimum at 2034. and a post ‘Eddy Solar Minimum’ SC26 maximum in 2038. It is good to see that other methods give different predictions as this is a way to test them. If the minimum is in 2019 then that empirical planetary method must be wrong, right? Or can it be adjusted post-hoc so it is still valid? I see no value in such speculation before the event. But in the meantime you could ask to see the nature of the hindcasts that the prediction is based upon. “Or can it be adjusted post-hoc so it is still valid? Science is not about believing. And it is good to be skeptic in the absence of strong evidence. The primary elements of Earth Venus and Jupiter have been noted since the 19th century, I independently noted it in 2004 before I had heard of it elsewhere. Their synodic cycles do not fall out of sync with sunspot cycles, but their syzygies do not always coincide with each sunspot cycle maximum, they can be years apart, and they cannot indicate where each cycle minimum occurs, or which sunspot cycles are weaker during each centennial solar minimum. With the addition of two more planets, the timing of each sunspot cycle minimum and maximum, typically within one year, and which cycles are weaker during each centennial minimum, becomes fully self apparent. Far from compromising, that will be a much better ( less distorting ) filter than the modified running mean. It is still a pretty crude triangular window shape. I would suggest an 9 pole binomial is you want to limit yourself to 9 weight windowing. With enough terms it ends up being a gaussian filter. If you install free gnuplot you can see what it looks like by entering the following values into the gnuplot console. Great work, good clear graphics. With respect to my predictions, like President Obama on gay marriage, I have evolved. To a higher state of consciousness. We are going back to 19th century-type solar activity which does imply the potential for mid-summer frosts in the Corn Belt. Evolution is good, but you must consider that even if we get the same level of solar activity as some time in the past, that doesn’t mean we get the same climate. The planet is now significantly warmer than it was in the 19th century, and the planet is very slow in changing its temperature. A couple of low solar activity cycles won’t produce much cooling. Hopefully enough to prove that CO₂ is not the control knob. … but hopefully not enough to kick off another little ice age or even another not-so-little ice age. Faster than you think. The mid-latitudes cooled in Solar Cycle 20 relative to Solar Cycle 19 and thus the 1970s cooling period. North Atlantic water column temperature peaked in 2006 – we are already 12 years into the cooling. And all the big scientists never got it..
Don’t variable stars, umm….vary ?? Do we really have any kind of long term track record for reference ? Yes, most of the stars we see are variable with no rhyme or reason for the many different periods and amplitudes seen in the variability. Whether or not sun spot cycles are related to the variability seen in most other stars is likely an open question, but I would give it good odds of being the case. There’s one thing left out of this, and that is the massive “explosion” that occurred on the Sun before it shut down in 2006. NASA did record it, released the video to the media, and that was about it. It covered about a fourth of the solar surface. I would call that a gigantic sneeze by the Sun before it decided to shut down. The next cycle didn’t start up for 18 months, in the fall of 2008 and it was quite weak. There were mutterings about a Maunder Minimum, LIA, etc., but it faded from the press because the Eyefjallajokul volcano blew its stack shortly after that and shut down air traffic in Europe. That was far more interesting to the press than the possibility of a prolonged solar minimum, so now we’re having a prolonged solar minimum, one period overlapping the next and no one has even addressed the consequences of that enormous flare in 2006, which I think we are seeing now. Just my view on it. I had to run the furnace again this morning. Global warming period, my fat Aunt Harriet! 1) That the 0.1% variation in TSI is enough to cause a 0.7C variation in the Earth’s temperature from peak to trough of a solar cycle. 2) That we can measure the temperature of the earth to 0.01C. Therefore it should be possible to find an ~11 cycle in the temperature data. If that cycle can’t be found, it means one of two things. 2) That we can’t actually measure the temperature of the Earth to 0.01C. it should be possible to find an ~11 cycle in the temperature data. The effect of the 11-year solar cycle on temperature data has been found. K.K. Tung has a couple of articles on it, and some other authors too. It is 0.07-0.1°C decrease from solar maximum to minimum. It is 0.07-0.1°C decrease from solar maximum to minimum. The solar cycle TSI influence in SC24, from the climb up to the maximum from the minimum raised HadSST3 by 0.355°C (yearly data), 0.488°C in monthly data, with the widest swing of 0.596°C, 1-’08 to 1-’16. The HadSST3 fall from the peak so far is 0.267°C (monthly), >>>0.07-0.1°C. The entire rise and fall of SST/OHC is solar cycle TSI-insolation driven, including the ENSOs. Gr8 stuff but please clarify, solar min = cooler weather on Earth and solar max = warmer? Or no clear correlation? – For above average activity solar cycles there is a ~ 0.1°C decrease from solar maximum to solar minimum due to the Sun. – For below average activity solar cycles when several of them take place in succession, it correlates with periods when no warming takes place and usually significant cooling takes place. How did you get a timescale on Top and and on Bottom of the WFT Graph? First you create two figures at the same scale in WFT and then you merge them with an image editor, moving the scales of the second figure to the opposite sides. WFT won’t do it for you. It is an interesting analog, isn’t it? And Javier, did both el ninos (los ninos) occur at the same point in the solar cycle (right after solar max)? 1878 El Niño took place at a time of very low solar activity, close to the minimum. What they should have in common if SC25 is as expected is that both were/are to be followed by a weak solar cycle. A tangent to this discussion; but maybe relevant. We are currently seeing a couple of major volcanic events. Is there any connection between these and the current status of the sun? I am thinking of the Carrington event of 1869. Apparently there was some connection between this and some volcanic activity at the time. Does anyone have any views on this?? A correlation between solar activity and volcanic activity has been noted for a long time. Nobody can propose a mechanism that makes sense so nobody quite knows what to do with it. It is one of those odd results that probably don’t mean much but may some day turn out to be the key to someone’s shiny new theory. Most likely it is just coincidence. Events at the 95% significance level happen by random chance 5% of the time. That is why it is not a good idea to go correlation hunting without a theory in hand. Hmmm; maybe fluctuations of solar output affect the magnetic dynamo, which affects magma flow patterns, which push already stressed crust areas over the edge? Pure off the cuff, totally uninformed, speculation on my part. The correlation between volcanic activity and solar activity is very poor and non-convincing for a skeptic. However there is a correlation between changes in ice loading and volcanic activity, and between solar activity and ice loading changes. This would explain why during the little ice age, a period of very low solar activity, the expansion and contraction of glaciers correlates with an increased volcanic activity. On a large-scale, magnetic fields might have some affect (nuclear / chemical / mechanical?) in the earth’s core commensurate with the strength of the field. And what part, if any, does gravity play? Any physics models or small-scale experiments in the area of the interactions of multiple fundamental forces on matter at scales as large as planets? The end of SC23 should have been called 9-11 months earlier than it was. SC24 was a laggard. SC23 was a pretty normal cycle length otherwise. SC24 would then be a typical length then. The SC23-24 solar minimum is plotted in figure 8 as a dotted line. While solar activity was almost as low six months before the minimum, I don’t know of any criteria that allows to place the minimum 6 months earlier. The similitude between SC23-24, SC11-12, and SC12-13, (figure 8) where in all three cases the cycle after the minimum had similar amplitude (figure 9) suggests that the SC23-24 minimum is well placed. Why is solar activity a topic here? TSI is a virtual constant. Ultraviolet radiation affects the ozone layer, but not the climate in any discernable way. CO2 affects the so-called Average Surface Temperature only one way, by changing the temperature at which the Earth’s Atmosphere radiates to space. More CO2 raises the altitude at which the atmosphere radiates to space, lowering the temperature at which the atmosphere radiates to space, leaving slightly more energy in the atmosphere. For the life of me I cannot understand why all this fuss goes on and on about “forcings.” There are no forcings, only the way the atmosphere radiates to space. “Back radiation,” also does not exist. Every molecule in the atmosphere radiates at all times in all directions. CO2 at the TOA makes the atmosphere slightly more opaque to LWIR leaving the atmosphere. I understand that this is a subtle effect, and if you did not go through Mechanical Engineering school and pass all the tests to prove you understand this, it is OVER YOUR HEAD, but, believe me, this is well understood by people who are too busy with productive work to engage here. The readers do understand the concept and limits and extrapolations of CO2 limited affect on global average temperature. It is actually the “low information voters” – who tend to vote liberal-democrat-socialist tickets in the US political systems – who do not understand the science involved. It is those low information voters who are most easily convinced by the “97 percent” arguments by dictate from the media, the “scientists” and the politicians and academia who chase the fortunes made possible only by controlling the carbon futures trading trillions. Your very general statements covering TSI, CO2, back radiation, forcings definitions, global warming in theory and as-measured, etc, etc have been discussed in great detail in the 2.3 million comments preceding yours above. As a new reader, please stay on for a while before making unfounded accusations and vague assumptions. And what were those unfounded accusations and vague assumptions? Logarithmic effect of CO2 is described badly. All it actually does is lower the altitude at which CO2 absorbs virtually 100% of outgoing long wave IR, from maybe 10 meters above the ground to maybe 9 meters. At this tiny altitude CO2 does not re-radiate, it thermalizes, distributing the energy to the thousands of molecules of O2 and N2 and Ar in its immediate vicinity. Vague, general, unfounded, new, oh really??? Because the effect of changes in solar activity on climate and weather is a scientific subject of debate with hundreds of scientific articles published every year on the subject. You appear to be a “the science is settled” type. Well, it is clearly not settled. I agree, but that doesn’t tell us how much warming the increase in CO₂ is producing, does it? Nothing in the theory says it couldn’t be very little. The problem is not with the CO₂ but with the feedbacks within the climate system. I think you don’t understand the main issue in the climate debate. It is not if the CO₂ has an effect on climate, it is how much effect it has. Have you heard of the term “climate sensitivity”? Oh my! You are full of it. This baloney is being discussed by climate scientists, atmospheric scientists, and solar scientists, all of them with their relevant PhD’s and with a lot more knowledge of the issues involved than mechanical engineers. When somebody believes members of his social group, political party, race, … are superior to others he is only showing how inferior he is. Michael? Your response? I’m sure I speak for everyone here when I say we’d like to hear it. This is your chance, an opportunity. Defend your position, be specific and articulate your thoughts. Insults are welcome. Michael Moon, you posted “All it actually does in lower the altitude at which C2 absorbs virtually 100%of outgoing long wave IR . . .”. In addition to Javier’s response to your OP, I would gently suggest that you examine the absorption bands of CO2 in comparison to both the solar spectrum (input) and the Earth’s grey body radiation spectrum at a temperature of 288 K (output). You will find that CO2 is a secondary factor compared to water vapor in affecting the radiation balance. Water vapor (especially when condensing to form visible clouds) is a generally-accepted “forcing” (i.e., feedback mechanism) . . . among other things, need I mention albedo? There are theories and data that support the level of solar activity-dependent particle radiation into Earth’s magnetosphere and atmosphere affecting cloud formation on Earth. From one ME to another . . .
That is not what the Emperical values show. They show that Increased CO2 has shown to increase Radiation to space, regardless of what height it radiates from. Also the transfer time of radiation through the atmosphere means “slightly more energy in the atmosphere. ” would only be there for a very short period of time and do nothing to slow the heat loss to space at night. Only dense moisture & Cloud cover does anything significant, or perhaps you have an explanation for why Dry Deserts are so cold at night? Yes, hypotheses that predict the solar minimum at a certain date are going to be put to the test. At least we will be able to discard some. Any cooling in the early 20st century ended in 2014 with the pre-El Niño, since the huge 2015-2016 El Niño affected every index. We will have to wait a few more years to see what the post-El Niño situation is with respect to the pre-El Niño situation. Even the rotation of the planet is affected by El Niño due to the effect on the Westerlies. LOD has been on an increasing trend since 2003, but it also had an increasing trend between 1987 and 1994, so it is not evidence of cooling. Equatorial dipole is well correlated with geomagnetic activity. The visible peak in 2015 could have been a signal for ENSO. Earlier, El Niño could not develop. Look out for the southern polar field. Based on what? Your last lines get more unsupported than the main body and should not be anywhere near a heading labeled Conclusions. My expectations are obviously not a conclusion. They are based on solar activity cyclic behavior as indicated both by cosmogenic isotopes and sunspots. The centennial minimum ought to be over after SC25, and we are still close to the millennial peak of activity, so high solar activity is more probable than low solar activity after SC25. What’s the point of drawing spaghetti lines in Fig. 6-8 if the reader can’t identify related cycles that look similar to the red line of the current cycle. The point is to offer the range of possible outcomes based on past outcomes. Considering that sunspots are probabilistic, the exact paths from previous occurrences do not have predictive value on the exact path this time. The minimum not before 2020. 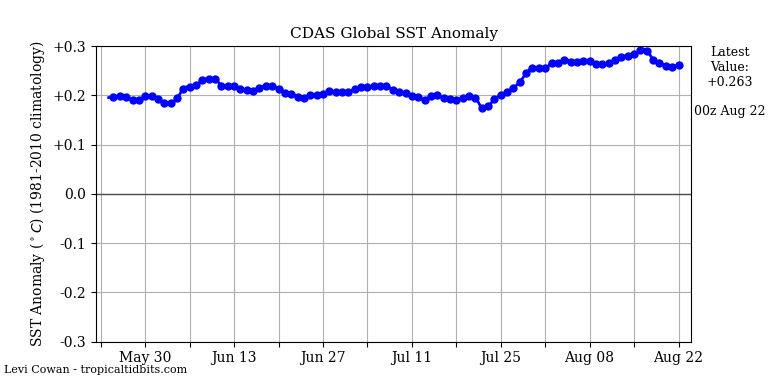 Since June 1, there has been a large drop in the activity of the solar wind. Just checked one of my old physics books. The magnetic field intensity At a point perpendicular to a dipole varies inversly with the 3rd power of the distance from the dipole. At 93 million miles a small difference in the dipole strength will make a large difference in the magnetic field strength at earth. he magnetic field intensity At a point perpendicular to a dipole varies inversly with the 3rd power of the distance from the dipole. At 93 million miles a small difference in the dipole strength will make a large difference in the magnetic field strength at earth. Varies INVERSELY, so a small difference at the Sun is a negligible difference 93 million miles away. But that is not how the physics works for the sun. The expanding solar atmosphere brings the magnetic field our into the solar system, so the magnetic field falls off a lot less than from a vacuum dipole field. The problem here is that this could not be done in those days because of the clouds in w-Europe for months on end…there were no satellites? Here is a quality paper backing that up: “On the influence of solar cycle lengths and carbon dioxide on global temperatures”. Recently published by the Journal of Atmospheric and Solar-Terrestrial Physics (JASTP), it is a rare example of a peer-reviewed connection between solar variations and climate which is founded on solid statistics. It is available at https://doi.org/10.1016/j.jastp.2018.01.026 (paywalled), or https://authors.elsevier.com/a/1X30-4sIlkaszt (free access until July 4th 2018), or in publicly accessible pre-print form at https://github.com/rjbooth88/hello-climate/files/1835197/s-co2-paper-correct.docx . The presence of two minima, at 96/05 and 96/08, is what causes the difficulty. A natural choice would be the mean of these two, 96/06.5. However a more subtle procedure is available, as follows. Postulate any particular whole or half month, m, for the minimum, and then calculate differences between the mirrored months (m+x) and (m-x) about that point. A preponderance of positives (respectively negatives) means that m was chosen too large (resp. too small). The positives indicate that m = 96/07.0 is too late, but in order not to split hairs we accept this value. This monthly value, 7.0, is then converted into a decimal value by (7.0-1)/12 = 0.5 (just as the next minimum, in December 2008, gets converted to (12-1)/12 = 0.917 ~ 0.9 giving 2008.9). The conclusion is that the minimum preceding SC23 should be recorded as 1996.5. As I said in the article, the position of the minima depend on the criteria employed. No criterion is a priori intrinsically superior. Different smoothing formulas give different positions for the minima. The result of all this is that solar cycle length is a relatively imprecise measurement that depends on the method employed. For the 1996 minimum, my smoothing formula, which is more responsive, confirms two minima but places them in April and October 1996. Logically, I would assume that the last minimum is the real one, after which the new cycle increases in activity. So I would place the minimum in October 1996, or 1996.8, as the authors of the paper do. 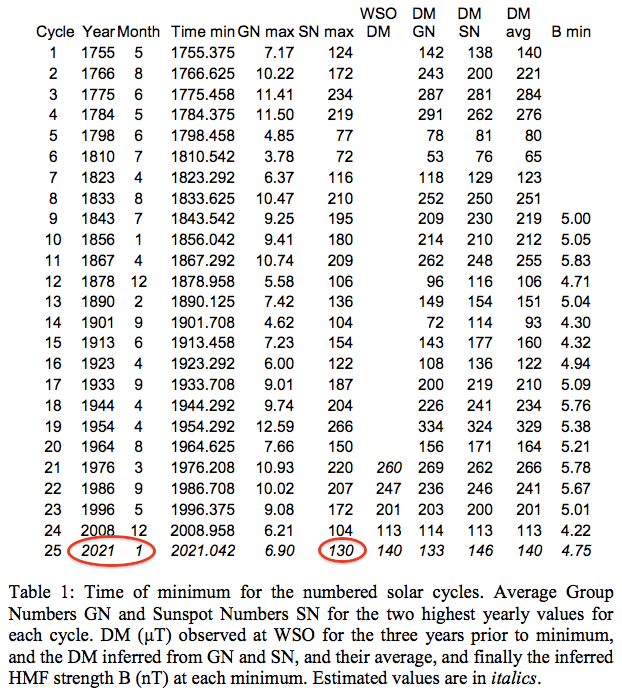 Sunspots from solar cycles 22 and 23 only reached parity in 1997.0, confirming the later minimum. All over 1996 the old cycle sunspots dominated. Then solar cycle length does not correlate with solar activity, as figure 1 in the article shows. What little correlation is there is coming from the very active short cycles in the Modern Maximum, and the very inactive long cycles in the Dalton minimum. The rest of the cycles show no correlation at all. Your article is interesting, congratulations. However I am uncertain about how the correlation between solar cycle length and temperature can be produced if it is not through solar activity. This is a joke of a paper. Javier, the problem with having different criteria for minimum is that then people can pick and choose. The 13-month sum-of-two12-month averages is well established and often gives an uncontroversial result. But for SC22/23 there were two minima; my method unpicks that to find the point around which the counts are most symmetrical, still using the 13-month data. This gives July 1996. I should (TODO) probably use my method on other minima to see how it pans out. Then perhaps I might be able to seek greater acceptance of it! Regarding the correlation between solar cycle length and temperature in the next cycle (and slightly the cycle after that), I believe there is a non-linear function involved, and I have seen someone write on WUWT that a sunspot count below 40 leads to relative cooling, though a peer-reviewed paper on that would be a great thing! A long cycle naturally involves a longish period with a count of below 40. And regarding your Figure 1, I believe that is activity of Cycle n against its length. I am sure I have read that the length of Cycle n is better correlated with the activity of Cycle n+1. Have you considered this? As stated I have several new theories to calculate the start of a new cycle. One of them (in review) agrees with all the official starts, except for September 1996. There I find a start for August 1996. Javier or anyone else, if interested in the polar field calculation, you can mail me patrick.geryl addd skynet.be. Patrick, looking at your Table 1, you could be right – but I don’t think so. First note that in 2008 the solar sunspot minimum (2008/12) was 6 months after the flux minimum. Second, note that you are assuming that the flux minimum already occurred around March 2018. Now, in May the sunspots and flux have been higher, and you may well say “there you go, we are past minimum”. But the number of spotless days and the butterfly diagram, mentioned up-thread, are both against you. Rather, we are still on the bumpy descent to minimum. So I think that in 2 years time, when we can finally see that solar minimum has passed, you will have to reexamine your theories very carefully. My criteria for solar minimums is solar flux readings 90 or less. Javier ,this is what Theodore White has to say about the solar/volcanic tie in. He said it excellently far better then I could. I want to add the weakening of the geo magnetic field is going to compound all of this. Common, Salvatore. This is all a wild conjecture without a modicum of fact or evidence, and without a single scientific citation. The numbers are awful and totally unconvincing. The most honest of them, Jaroslav Strestic ends saying that a millennium of data would be required to conclude if there is a relationship. The alternative explanation, that changes to continental ice load are responsible for increased volcanic activity, appears a lot more probable and already has a clear mechanism that is known to be physically possible. The mechanism I think is there, as he explained. For the record I expect an uptick in explosive volcanic activity over the next several years which will aid to the global cooling scenario. Even without that I expect the global cooling of late to continue as long as the sun stays sub par. 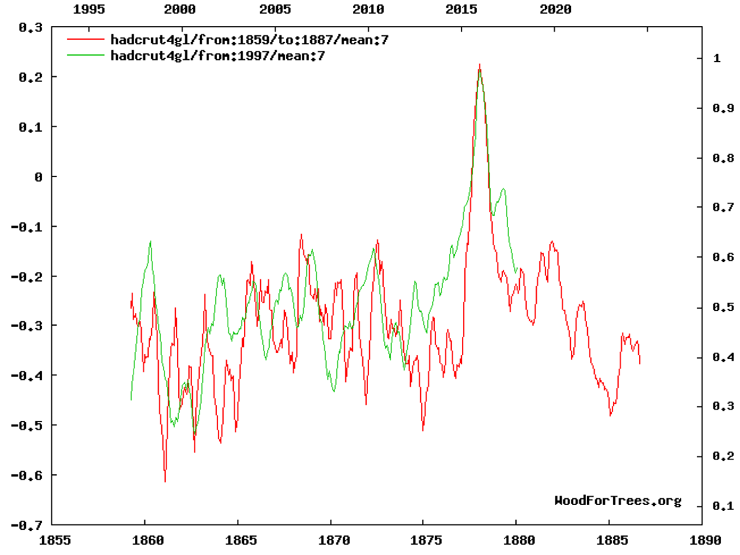 I will be shocked if global temperatures should resume an upward trend from here. At best I see no change but more likely colder. How much cooling is the question, but the overall sea surface temperatures are now only +.13c above means (still warm) but down from around +.35c above means this past summer and global temperatures thus far are down this year in contrast to last year according to satellite data. I have called for 2018 to be the year the global warming trend ends and a new cooling trend begins based on my two solar conditions coming to be, which are sub solar activity for 10+years and within the sub solar activity very low average solar parameters. Now present. The Siberian Traps, fingered as the cause of the Permian-Triassic mass extinction event, aka “The Great Dying”, c. 252 Ma, released an estimated 4000 billion tons of sulfur dioxide during their 900,000 year-long flood basalt eruption, among other pollutants. Dunno how to delete. Seems not to be an option in Edit. It was found that the value of DM over the three years preceding the minimum is relatively constant with only a slight decrease over time (due to pole-ward migration of emerging new-cycle flux) was sufficiently stable that its average single value was a good precursor at least for the last four sunspot cycles. Table 1 gives Leif’s estimate for the SC23-24 minimum and sunspot maximum (red ovals). The problem is that Leif’s estimate for the minimum is an outlier. At January 2021 it would make the SC24-25 minimum the longest ever with 50 months from ≥30 sunspots to minimum (see figure 5). So it does not appear correct at this time. By choosing such a late minimum Leif is probably overestimating slightly the maximum activity of SC25. I think a minimum in early 2019 could cause a slightly lower value for SC25 max using Leif’s methodology because PFavg, (N-S)/2, was slighly lower in January 2016 than it was in January 2018, which I believe was the HMF date evaluated by Leif for a hypothetical sunspot minimum in January, 2021. Note also that PFavg was even lower in January 2017, which should result in a correspondingly lower SC25 max value for a sunspot minimum in 2020 using Leif’s methodology. In either case, I also think the actual values for GNmax, SNmax, DMgn, and DMsn at the actual time of sunspot minimum will be lower than values estimated three years prior to minimum, and will result in a correspondingly lower HMF strength. I agree. One problem with the Polar Field method this cycle is that unlike previous cycles, instead of “over the three years preceding the minimum is relatively constant with only a slight decrease over time,” it has shown an increase that is not clear if it has ended or not. This should affect the predictions depending on the date chosen as you comment. When we think we have the Sun figured out, it surprises us again. This is an interesting exchange and so with all things on this blog, I expect people to want to hear absolutes. I also want to make a fortune in the stock market. Javier has a great post, but extrapolations are very difficult and so we all could be surprised in the end when SC25 is nothing that you would all expect. Agree there are no absolutes when it comes to the sun and for that matter the climate.